The design for the proposed temporary skate park in the East parklands. Designs for a temporary skate park in the CBD worth nearly $500,000 have been revealed, but skaters say it’s too little, too late. The State Government has provided three quarters of the funding towards a $490,000 temporary skate park in the east parklands, between Wakefield and Bartels roads. However, it has not announced funding for a permanent facility to replace the city skate park on North Terrace since that was closed earlier this year. 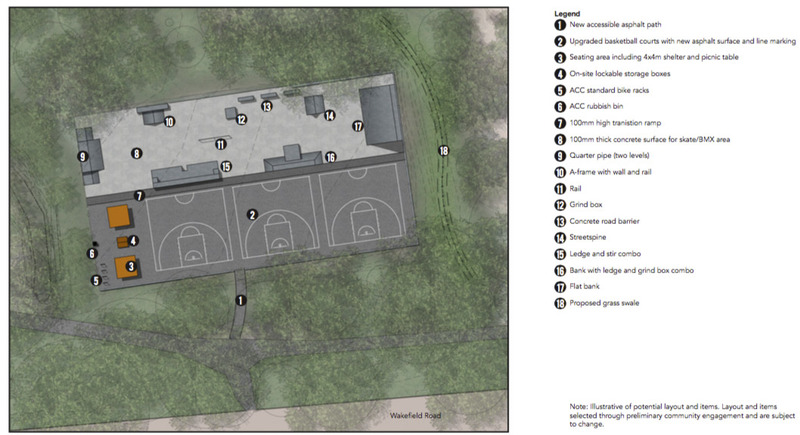 The proposed temporary facility, designed by Adelaide City Council administration in collaboration with the SA Skate Space Association, includes ramps, rails and grind boxes, as well as upgraded half-sized basketball courts and a picnic shelter. SASSA spokesperson, skater Andy Walker, who was involved in the design of the park, told InDaily that young people in Adelaide had been without a city skatepark for too long, and that a permanent, state-of-the-art facility was urgently needed. “We don’t know how long ‘temporary’ is,” Walker said. “We were … confined with what we could do (with the temporary design) but we did the best with what we had. “We’ve just taken a lot of good obstacles from other skate parks that we’ve seen and tried to put the best bits into one. Deputy Premier John Rau said the State Government was “committed to installing a temporary skate park while the final location for a new permanent park is determined”. However, Walker said the people who previously used the former city skate park facility would have numbered in their thousands, including BMX riders, skaters and younger kids on scooters. Since the closure of the facility “there’s been a bit of a slowdown in the scene … and I think it’s probably meaning that some kids aren’t being as active”. “A central facility is quite crucial,” he said. Walker said a permanent city facility should ideally be located on the riverbank. Greens MLC Tammy Franks said it was a waste of money to construct a merely temporary skate park. “It’s being spent on a temporary facility, whereas we should’ve planned ahead and built a state-of-the-art (permanent) facility,” she said. “We could have a facility that brings tourists in, functions not only as a skate park but also as a place to have competitions. “You could’ve even seen it incorporate things like roller derby, with adjoining facilities. Franks said a world-class permanent facility could cost between $2 million and $4 million. The designs will be presented to Adelaide City Council’s Finance and Business Services committee for debate next week.